Minister for Education and Skills, Richard Bruton TD this morning turned the sod on Institute of Technology Carlow’s new €15million, 31-acre South Sports Campus. The first phase of the project will deliver six full-size playing pitches, comprising one all- weather artificial GAA pitch, one grass GAA pitch, two grass soccer pitches and two grass rugby pitches. Works will also include LED floodlighting and a 1.6km looped walking trail. Phase two, to commence next summer, will encompass a 400m athletics track and a pavilion building, to include changing rooms, meeting rooms and ancillary spaces. Phase One works are scheduled for completion in spring 2019; it is anticipated phase two works will be completed by spring 2020. South Sports Campus is the latest development in a larger €150 million capital investment programme at Institute of Technology Carlow that has already delivered the Haughton Teaching and Learning Building in 2016, the Centre for Aerospace Engineering in 2015, the Dargan Centre for Research and Innovation in 2014 and a multi-million euro Student Services and Sports Facilities Centre in 2012. Works are also in progress for the development of a new €20million Applied and Health Science Building, an extension to the Learning Resource Centre and the development of a new Wexford campus. 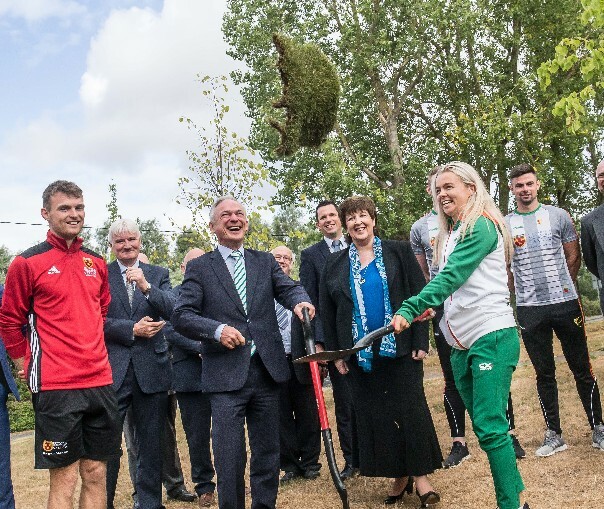 South Sports Campus will complement and greatly enhance Institute of Technology Carlow’s existing first-class sports facilities and its growing portfolio of sports related programmes. Honours degree programmes in Sport Coaching and Business Management in conjunction with the GAA, FAI and IRFU are not offered in any other third-level institution. Opportunities for research up to post-doctorate level in sport science, strength and conditioning, sports rehabilitation and performance analysis provide further attraction for students and sports governing bodies alike. Speaking at the ceremony, Dr. Patricia Mulcahy, President, Institute of Technology Carlow commented, “Today is a proud day for this Institute as we commence work on South Sports Campus. At a time when our sport and health policies are seeking to encourage people to take more exercise, South Sports Campus will ensure that Institute of Technology Carlow is the higher education institution of choice for students wishing to combine their academic study while participating at performance, competitive or recreational level in their chosen sports. Institute of Technology Carlow was recently identified by Competitions Committee of Student Sports Ireland (SSI) as Sports College of the Year for its involvement in SSI third level competitions during the 2017-2018. The addition of South Sports Campus will also allow us to strengthen well-established links with national governing bodies and other local agencies, and provide further health-enhancing sporting opportunities for communities across the region”. The sod turning ceremony was attended by many collaborative partners, including representatives from the FAI, GAA and Leinster Rugby. Elected representatives, education and sporting bodies, principals, guidance counsellors, staff and students were also in attendance. Tony Patterson Sportsgrounds Ltd., with over 40 years’ experience in delivering sports pitches, has been awarded the contract for the provision of South Sports Campus, following a competitive tender. The design team is being led by Tobin Consulting Engineers. Since its founding in 1970, Institute of Technology Carlow has generated over 55,000 graduates. It currently ranks as the 4th largest of Ireland’s 14 Institutes of Technology with over 8,300 enrolments and 800 staff. Institute of Technology Carlow provides higher educational programmes, and research and enterprise development opportunities, through centres in Carlow, Wexford, and Wicklow. The Institute offers more than 80 taught programmes to Level 9 on the National Framework of Qualifications (NFQ), and boasts the second highest percentage of postgraduates in the IoT sector. Institute of Technology Carlow has the highest percentage of Lifelong Learners in the higher education sector, which reflects the commitment to providing higher educational opportunities for all.